A very unique property set on 15 acres. The beautiful lake view reflects both peace and quiet! A shelter belt partically surrounds this acreage. It does not impede the sight of future maturing crops swaying in the wind or the view of Pelican Lake. This property is flat with two good size dugouts. One dugout had been used as a source of providing water to the home. Present owners use the 2,000 and 1,00 gallon cisterns. Thereby providing you with two water supply choices. Four original outbuildings, 2 of which in the 1940's were used for grain storage. Other outbuildings include a Quonset, detached garage (with wired workshop) and a grainery converted for even more storage. The yard has fruit trees providing an abundance of apples and a fences (1 1/2) dog run. Home has updated windows, newer efficient furnace, central air, an ultra violet filter system for the water. The basement is presently used for storage with a separate cold storage area. In 1980 an addition of 600 sq. ft was added. A gas fireplace compliments the cool evenings and ambience. The main level has two bedrooms, one which was converted to accommodate the washer and dryer. With two more bedrooms upstairs. Located close to Brownlee and 35 minutes away from Moose Jaw. 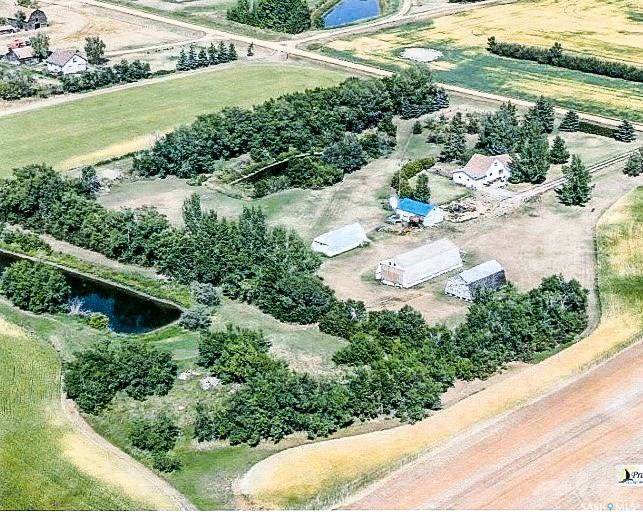 This is the acreage you've been looking for.